"These cookies are so versatile! They are delicious, naturally low-fat, and even make terrific Christmas ornaments that keep for years. Royal Icing is best for decoration. CAUTION: These cookies have a way of disappearing!" In a large bowl, cream together the butter and brown sugar until smooth. Stir in the molasses and eggs. Combine 1 1/2 cups of the flour, baking soda, salt, allspice, cloves, cinnamon, and ginger; beat into the molasses mixture. Gradually stir in the remaining flour by hand to form a stiff dough. Divide dough into 2 pieces. On a lightly floured surface, roll out dough to 1/8 inch thickness. Cut into desired shapes using cookie cutters. Place cookies 1 inch apart onto ungreased cookie sheets. In a medium bowl, sift together confectioners' sugar and cream of tartar. Blend in egg whites. Using an electric mixer on high speed, beat for about 5 minutes, or until mixture is thick and stiff. Keep covered with a moist cloth until ready to frost cookies. They weren't sweet enough for our tastes - and too crunchy. I didn't use icing, though - that may have helped. 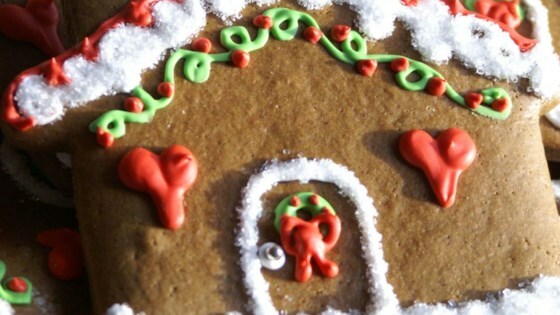 Best gingerbread Ive ever made! It wasnt too dry or hard, and it made perfect little men for decorating. I did add about half a tsp more ginger powder, but everything else was perrrfect! This gingerbread is soft and delicious. The whole family loved them and my littlier ones had a great time making them with me. Definitely a keeper!